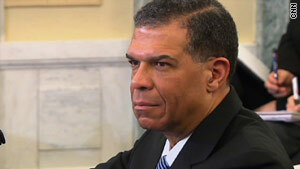 Robert Harding is President Obama's second nominee to head the Transportation Security Administration. Washington (CNN) -- President Barack Obama's second nominee to head the Transportation Security Administration side-stepped questions Wednesday about whether he supports unionizing the nation's 40,000 airport screeners, but acknowledged the president's support for unionization of screeners and said any such plan should be done in a way that would not hurt national security. Treading lightly on a topic that helped to derail the president's first nominee, Robert Harding likened his role to those of presidential appointees who are advising the president on closing Guantanamo Bay or allowing gays in the military. "My recommendations would be very unbiased, they would be very factual and I think that's what I owe the secretary [of Homeland Security] and the president," Harding said. Sen. Joseph Lieberman, I-Connecticut, pressed Harding on the topic, noting that military advisers were doing a review "geared on how best to implement the decision" of the president. "Is that essentially what you're saying, that's what you're going to do here?" "Yes, Mr. Chairman, and make a recommendation to the secretary and the president," Harding said. Administration officials said Wednesday night that Harding still has not made a decision on whether he supports unionizing the workforce and disputed a suggestion that his remarks signaled his support. The unionization issue has been a flashpoint between some Democrats and Republicans. Sen. James DeMint, R-South Carolina, put a hold on the first nominee, Erroll Southers, after Southers declined to say whether he supported unionization of screeners. Southers eventually withdrew his name from consideration after another controversy erupted involving a decades-old personnel matter. DeMint and other committee members said granting certain union rights to TSA screeners will jeopardize security by making the agency less nimble. Negotiated contracts could prevent managers from quickly moving union personnel and resources, they said. Supporters of unions said contracts can protect workers while maintaining security, adding that most other federal law enforcement agencies, including the U.S. Border Patrol, have been unionized. During the election, then-candidate Obama wrote a letter to union leaders promising to support unionization of screeners if elected. Also at Wednesday's hearing, Harding acknowledged "making mistakes" when a company he formed overbilled the government in 2004. At issue is a contract that Harding's company -- Harding Security Associates -- signed with the Defense Department in early 2004 to provide 40 interrogators and debriefers rapidly in Iraq. Within four months of his firm starting work on the contract, Harding said, the government decided to end the contract. "I then faced 40 individuals who were now without work," the nominee said, adding that some of them he had lured away from other jobs, including the CIA. Harding said he told his employees "that I would take care of them, and that I would negotiate and work with the government to provide severance payments." The total severance payments came to about $800,000, Harding said. "When I went to claim it from the DIA [the Defense Intelligence Agency]," government auditors "recognized that I did not have a policy on that, that I had not negotiated with the government for severance, I had not provided the government my plan for severance ... and therefore it was not allowed, that $800,000." Harding said that government auditors subsequently admitted "there were mistakes on both sides." Sen. Susan Collins, R-Maine, said she felt misled by a White House explanation of the events. The White House compared $2.4 million in disputed charges that included the $800,000 in severance payments to the $53 million potential value of the contract, instead of the $6 million value of the work. "Of the $6 million that HSA was paid, $2.4 million was [in] question. That's a pretty high percentage. The White House, in talking to me about this issue, compared it to $53 million, but that's not what was at stake here at all, and I thought the White Houses comparison was pretty misleading," Collins said. An independent investigation concluded that no fraud was involved. And ultimately, HSA reached a settlement with the government, with HSA paying back $1.8 million of the disputed $2.4 million. Harding said he learned from his mistake. He said the mistake caused him to add an accounting operation and otherwise professionalize the business, eventually increasing it in size from 60 people in 2004 to about 400 people when he sold the business last year. Following the hearing, Sen. Collins said that Harding "adequately addressed my concerns regarding" the contracts. "Before making a final determination, however, I want to review additional information in order to ensure that all relevant data regarding the nominee have been thoroughly examined," she said.